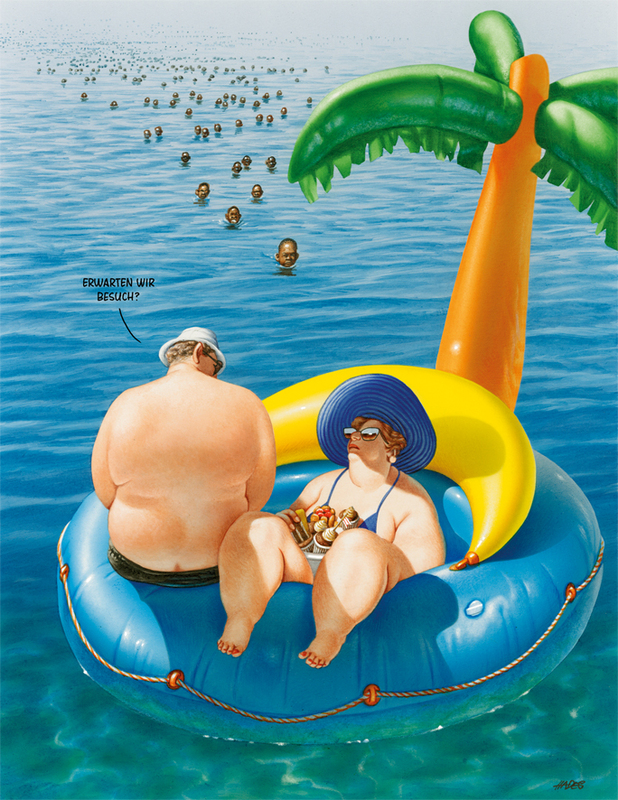 The Karikaturmuseum Krems presents the largest exhibition to date of Austrian cartoonist Gerhard Haderer. This is the first comprehensive survey ever to be shown of the high-class oeuvre of this graphic artist. Many of his best-known works are political cartoons, created in his capacity as a regular contributor to print media such as Profil, Wiener, Oberösterreichische Nachrichten, Titanic, and Stern. Masterly drawn and detailed mostly in acrylic ink, Haderer’s brilliant cartoons hold up a mirror to society, unmasking evils and abuses as well as fantasies of omnipotence, often with an element of tragicomedy. Drawn humor as a reckoning with taboos and double moral standards, but also as a chronicle of past and recent years with all their highlights, vicissitudes, and scandals. One special highlight of the show and also in keeping with its title, Think Big! Is a first-ever presentation of Haderer’s large-sized oil paintings. Satire in painterly fashion and opulence, quite in the manner of the Old Masters. The paintings introduce to the individual theme rooms, or main areas, of the exhibition: Austrian domestic politics and foreign affairs, criticism of the church, and a broad range of cartoons on sociopolitical issues. 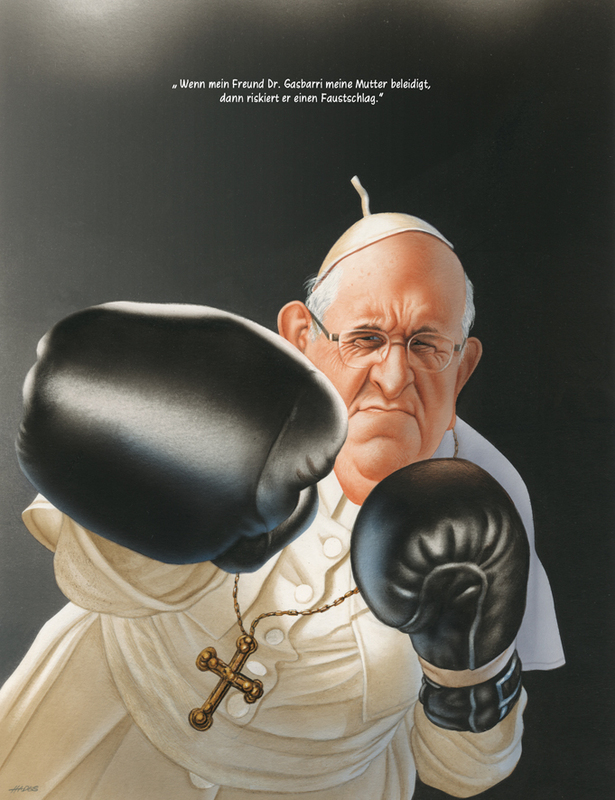 Haderer’s pieces on clerics and church dignitaries have remained topical to this day. Also, the show features originals of what has come to be a key work in Austrian cartooning history, The Life of Jesus. The works come from the holdings of the Lower Austrian State Collections, an important lender to the exhibition aside from the Vienna Rabenhof Theater and the artist himself. In addition, we also present Haderer as a book illustrator who works together with a number of renowned authors and as creator of his “pulp” comic book series MOFF.—another important variety of his humoristic art. Apart from the aspect of language, he focuses on the spontaneous articulation of his ideas here. Many of his quick hand drawings are later also executed as large-size color cartoons or even as oil paintings—like in his most recent work. For some years now, Haderer has also been active as a graphic artist and author in (puppet) theater and cabaret. Hand puppets were made after his designs by the Schneider puppet and marionette manufactory in Lichtenstein, Saxony, for a guest production of the original Vienna Praterkasperl (a Punch and Judy theater in the Prater amusement park) at the Rabenhof Theater, a double-edged puppet play with a voice-over from the satirical cult comedians of maschek. The result was an ingenious puppet-theater commentary on contemporary Austrian history. A graphic novel entitled Der Herr Novak was also adapted for the theater by Haderer and brought to the stage with a truly congenial actor, Ferry Öllinger. Gerhard Haderer has also been a friend and ally of several years of Jean Plantureux (pen name Plantu), the Le Monde caricaturist as well as the initiator and leader of the worldwide “Cartooning for Peace” platform, which stands up for graphic artists suffering political persecution and censorship in their home countries. Gerhard Haderer wants to pass on some of his political commitment; to do so, he established a “School of Disobedience” at the former Tobacco Factory in Linz, Upper Austria, an “encouragement project” against the general political disgruntlement, a school against lazymindedness and for the promotion of social and political debate. 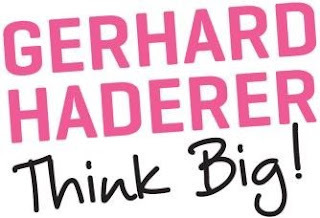 Gerhard Haderer – Think Big! 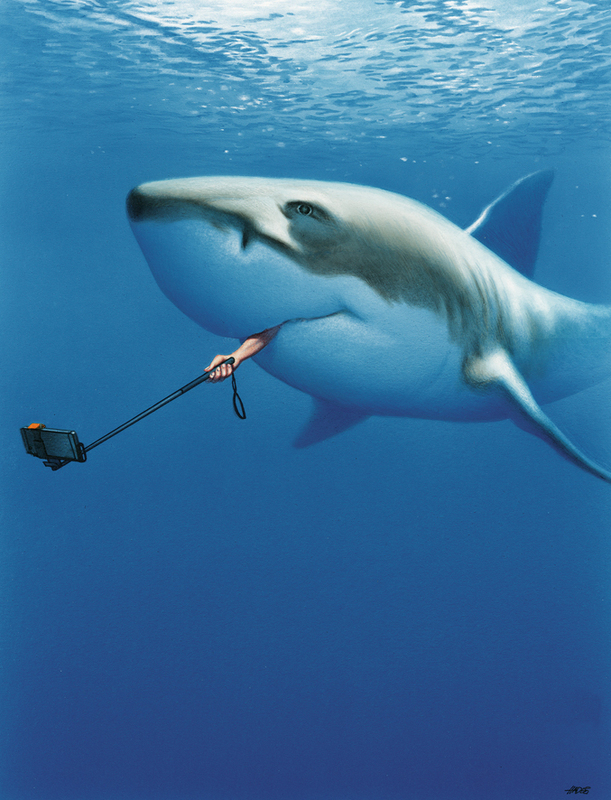 Is an opulent show of more than 200 original cartoons and six large oil paintings. A large number of sketches, studies, books, animated cartoons, and videos also on exhibit illustrate the artist’s versatility. With its comprehensive supporting and educational program, the exhibition makes a strong statement against everyday grandiose delusions, against political manhunts and thoughtlessness. You know, think! Or even better: Think Big!